Dr. Rachel Wong is a Professor in the Department of Biological Structure at the University of Washington. She received her PhD in Vision Neuroscience from Australian National University. Afterward she served as a Research Associate at the National Vision Research Institute of Australia. Rachel then conducted postdoctoral research as a CJ Martin Fellow at Stanford University and then an RD Wright Fellow at the Vision, Touch, and Hearing Research Centre. She served on the faculty Washington University in St. Louis before joining the faculty at the University of Washington. Rachel is with us today to tell us all about her journey through life and science. Rachel has a passion for music, and she is currently spending her free time learning to play the violin! She also likes to spend time with her lab members because they have become like family to her. In her lab, Rachel is working to understand how neural circuits in the retina (the light-sensitive part of our eye) are assembled during our development and how they can be repaired or rewired in disease. Rachel was always a curious kid. When she was in secondary school in Malaysia, she remembers bringing in random things to study under the microscope during her lunch break, especially things she would find in the creek near her house. Not getting the renewal of her first NIH grant was a devastating failure for Rachel. During this difficult time she was unsure if her career in science could go on. She tells us how she was able to get back on track and be successful. Rachel really enjoys seeing a project come to fruition and writing the paper. She also is excited about supporting and training the next generation of scientists. A recent trip to Israel was really memorable for Rachel because considering the thousands of years of civilization that have come through cities like Jerusalem really provided her perspective on her life and science. The discoveries they have made are exciting but really small in the context of the history of mankind. The Wong Lab loves to eat, and food is a big discussion topic for their group. Rachel and her lab members often go to dinner or cook together, as well as bring food in to share. One of her previous lab members taught them all how to make udon from scratch using some seemingly unconventional methods! We should not be limited by our current knowledge or expertise. Rachael has been fascinated by microscopy ever since she was in secondary school in Malaysia. In high school, she became interested in Physics and Medicine, and moved to Australia for undergraduate studies where she obtained a B.Sc (Hons) in Physics in 1981. In her Honors year, Rachel had the opportunity to develop her own ‘interdisciplinary’ project, using X-ray and Neutron scattering methods to study the structure of blood cell membranes from patients with Muscular Dystrophy. She became totally enthralled by research and pursued graduate studies at the John Curtin School of Medical Research at the Australian National University, where she obtained a PhD in Vision Neuroscience in 1986. There, Rachel gained a passion for studying the development of the retina, the light sensitive part of our eye. After postgraduate studies at the National Vision Research Institute in Melbourne, she was supported by an NH&MRC C.J. Martin Fellowship at Stanford University. Rachel returned to the Vision, Touch and Hearing Research Center (University of Queensland) as an R.D. Wright Fellow. In 1994, she joined the faculty at the Department of Anatomy and Neurobiology, Washington University in St. Louis, until relocating to the Department of Biological Structure at the University of Washington, Seattle, in 2006. 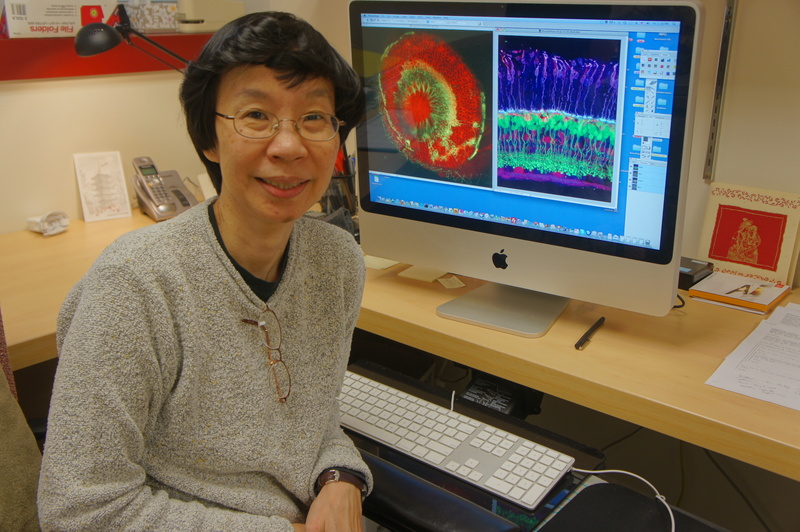 Throughout her career, she have applied and developed microscopy techniques to investigate the cellular behaviors and interactions that underlie the precise connectivity patterns of retinal neurons. Current efforts in Rachel’s lab are focused on elucidating how retinal cells can regain their proper circuitry after damage in disease.